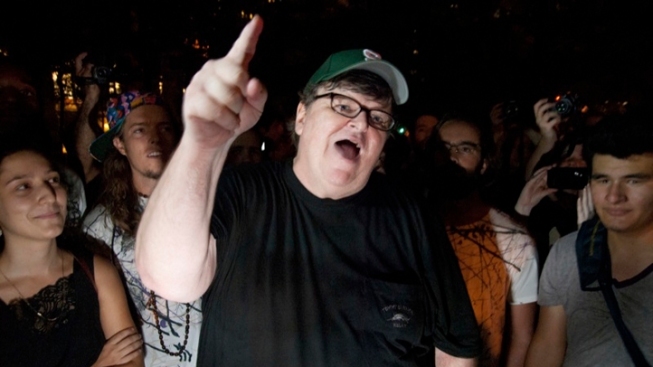 Filmmaker Michael Moore visits the "Occupy Wall Street" protest in Zuccotti Park on Monday. He doesn't dress like it, and he certainly doesn't hang out with many folks in his tax own bracket, but filmmaker Michael Moore finally admits on his blog that he is a "1 percenter." In a post titled "Life Among the 1%," the rotund Academy Award-winning documentary director describes how he made $3 million from his film "Roger & Me" more than two decades ago. Since then, he's made hundreds of millions more with such films as "Fahrenheit 911," "Bowling for Columbine" and "Sicko." In recent weeks, Moore has been hanging out with "Occupy Wall Street" protesters and decrying capitalism, but he says there's nothing inconsistent about being the richest guy in the protest against the rich. "I feel very blessed that I have this life -- and I take none of it for granted," Moore writes. "I believe in the lessons I was taught back in Catholic school -- that if you end up doing well, you have an even greater responsibility to those who don't fare the same. "The last shall be first and the first shall be last." Kinda commie, I know, but the idea was that the human family was supposed to divide up the earth's riches in a fair manner so that all of God's children would have a life with less suffering." The post went up after an appearance on CNN's "Piers Morgan Tonight" in which Moore denied being in the top percentage of income earners. "Of course I'm not," Moore said when prodded by Morgan. "How can I be in the 1 percent?" In an essay in which he seems almost defensive about his wealth, Moore does not tabulate his fortune. But he talks about his sizable donations to charity, unwillingness to buy stock, refusal to take most tax deductions and of helping to rebuild a black church that had burned down. Moore also mentions another millionaire, Kanye West, who was jeered in some quarters for showing up at the Lower Manhattan protests, wearing expensive clothes and bling. "He's down there demanding that his taxes be raised," Moore said. "That, to a right-winger, is the definition of insanity. To everyone else, we are grateful that people like him stand up, even if and especially because it is against his own personal financial interest."